A critique group is a valuable asset to any writer who wants to become better at her craft. By virtue of its name, it is supposed to be a forum to share works in progress and get feedback for improvements and praise for successes. Choosing the right group, however, is sometimes a difficult task considering each group has an agenda other than critiquing works. Some groups only have guest speakers come in to talk on topics of interest to the group. Other groups specifically hold writing workshops to help improve novice authors’ skills. And still others meet only to allow members to promote their own published pieces. After joining the Florida Writer’s Association and visiting a few writing groups in the area, I lucked up when a coworker and fellow author, Cheri L. Roman, suggested we start our own group with the strict purpose of critiquing each other’s writing. Cheri and I have attended the UNF Writer’s Conference in August together for the past two years. Each year, she would participate in the critique sessions and I wouldn’t. I didn’t feel my writing was put together enough to be evaluated by others. 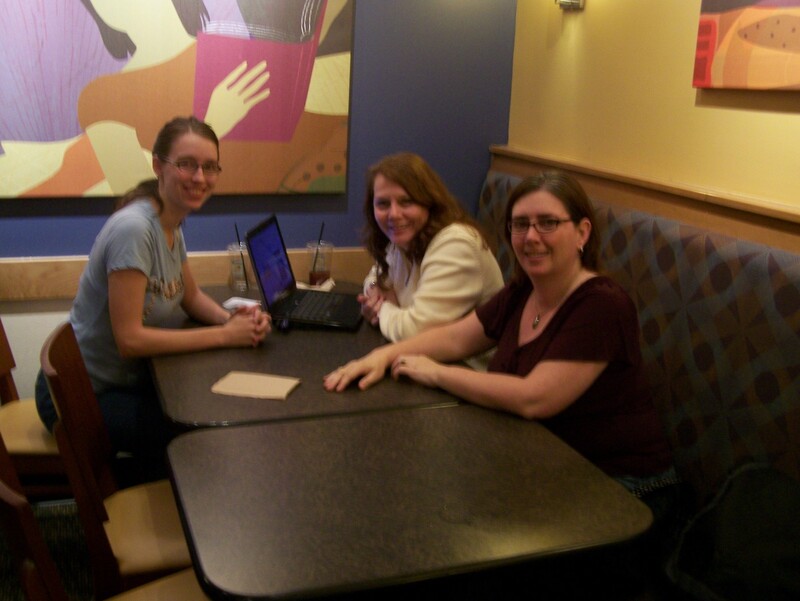 After the 2011 conference, Cheri emailed many of her critique group members with the idea of continuing the momentum of the critique sessions on a monthly basis. And though I didn’t attend the Writer’s Conference sessions, Cheri was thoughtful enough to include me in the email. Our first meeting was at Cheri’s house in September 2011. Four of us attended: me, Cheri and her daughter Rai Yates, and Cory Chamberlaine, a member of Cheri’s Writer’s Conference critique group. We established protocol for group meetings right from the beginning. We determined the length of texts to be critiqued, time limits for each critique, and meeting dates and times. We agreed that at any time these protocols could be changed to accommodate the group’s needs. Fortunately, they have effectively continued to help keep our meetings organized, with the exception of the rule for no interruptions by the writer during the members’ critiques. That is just too hard to uphold! So we allow some leeway. Our group has met every third Thursday of the month since September and has evolved in these first five months. The location has changed from Cheri’s house to Panera’s at St. John’s Town Center (for better proximity for all members). We lost a member (Cory) due to time restraints during his final semester in college. And Cheri has completed the first draft of her yet-to-be-named YA fiction novel. We have even made plans for a Writer’s Weekend in St. Augustine to critique whole manuscripts of each of the members, or whatever we can get written in the limited amount of time we have. The weekend is coming up near the end of April. But despite these changes, we still uphold our original purpose of critiquing our writing. My critique group has been my motivation to keep writing, even when I don’t feel like it. I know that I will need to have a selection written for my group to read by the first of every month. I know that I am responsible for reading my members’ pieces before our meetings and give them feedback to help them improve their manuscripts. I have established a friendly competition with Cheri (though she doesn’t know it) – since she has finished her book, I know I have to finish mine; we started writing them around the same time. At our last meeting we tossed around the idea of naming our group. I suggested it be something serious so we could sound credible. Rai said we need a frivolous name simply to sound fun. Cheri, the mediator, agreed with both of us. We jokingly combined serious and frivolous to come up with the name The Serivolous Panerians. I don’t think it’s going to stick, but I like it. It fits. This entry was posted in Matter of Opinion, My Take and tagged Cheri L. Roman, critique groups, Florida Writer's Association, FWA, Rai Yates, Tracie Roberts, UNF Writer's Conference. Bookmark the permalink.